Visions of Jesus Christ.com - Retired colonel has dealt with near-death experiences since Vietnam War. Diane Corcoran worked in the 24th Evacuation Hospital in Long Bien, Vietnam, in July 1970. 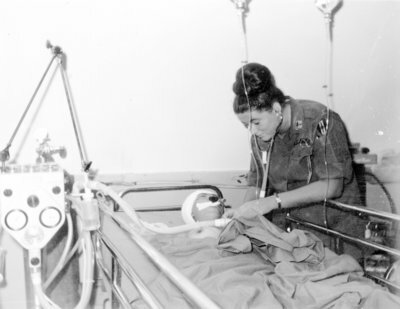 Many of the soldiers Corcoran tended in the neurosurgical ward described near-death experiences to her. January 24, 2012 Reported in the [Heraldsun.com] -Durham, NC. – Diane Corcoran didn’t know what a Vietnam War soldier was trying to tell her in 1969 about his near-death experience on the battlefield. The term was unknown then, but Corcoran could see that what he had gone through was life-changing. “I recognized that it was profound, extremely emotional for him,” she said. “And he was so worried that I wouldn’t believe him. But I said: ‘No, no. I believe you.’” Since that day more than 40 years ago, Corcoran has made it her mission to learn more about those who report near-death experiences, especially war veterans. Corcoran is president of the Durham-based International Association for Near-Death Studies (IANDS), which aims to educate people about the phenomenon and support those who have gone through it. She’s a retired Army colonel and nurse, serving from the Vietnam War through Desert Storm, and holds a doctorate in management. Gradually, Corcoran came to believe that many soldiers were having near-death experiences as bombs exploded and gunfire nearly took their lives. But many were uncomfortable sharing what happened, and felt they had no one to talk to. But Corcoran knew they needed an outlet – someone to share their life-transforming experience with, who wouldn’t be dismissive or think they were crazy. That person was her. She began by urging fellow medical professionals in the battlefield to take soldiers’ accounts seriously and to try to understand more about the near-death experience. “I drove them crazy,” she said. “I was probably 15 years ahead of the curve. They weren’t sure if I was crazy or what was the matter with me. But I was really convinced how important it was for health care professionals to know.” Corcoran spent years teaching about near-death experiences at major nursing conferences “and was sort of the go-to person in the military services,” she said. “Now, 40 years later, I still feel it’s important for all health-care providers to know about the near-death experience.” Veterans in particular, she said, often feel frustrated and alone, because medical professionals often don’t listen to their near-death accounts and take them seriously. If they try to tell a VA hospital doctor about it, she said, the doctor often lumps it in with a post-traumatic syndrome disorder diagnosis “and just dismisses it.” “If they could own their own experience and had somebody who really knew about it and understood it and give them information, these young men and women could do a lot to heal themselves,” she said. “But instead, they’re just further compromised.” Corcoran wants the military to address the issue, and has developed a training program to help them do so. In Durham, she said, two groups meet monthly about their near-death experiences, but another group for veterans is needed. “They are so frightened of losing their military benefits that they’re very hesitant to talk to anybody who really isn’t part of the military – certainly not the health-care professionals. They’re not going to tell them. So they’re kind of trapped in this situation, and it severely affects their spouses and family.” Corcoran also works with a group called Purple Heart Homes that includes two war veterans – one who had head trauma and the other a double amputee. They’re raising money to help veterans with housing issues by building homes and remodeling others. Corcoran said these vets don’t need therapy. “They just need someone to listen and give them good information. Many are more emotional than they used to be and wonder what’s happening to them. They might cry at touching events where they wouldn’t have before. They just need to know that they’re perfectly fine, and that this is one of the after-effects that can eventually be integrated.” Corcoran said she knows of one veteran who tried to discuss his near-death experience, but was medicated and sent to a psychiatric ward. “We’ve seen this reaction too often,” she said.